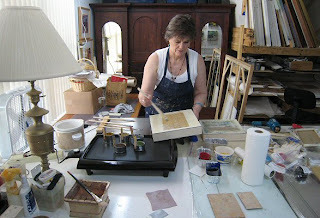 I’m making a big mess……..or should I say extending the big mess in my studio. Soon I’ll have no where to work/paint. 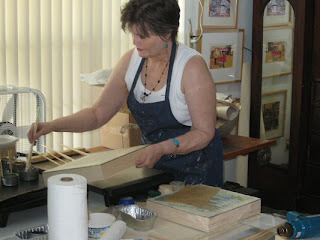 I decided…heck, make some panels for a little larger encaustic paintings. I can do it…yeah! So I dug out all the metal rulers and a square, an old miter box (although I’m not going to miter), glue and clamps and set out to make the first one of two 24 x 24″ panels. These will be framed with floaters if my experimenting turns out to resemble something I’d want to put my name on. (hum…reminds me I’m not putting my name/signature on these pieces on the front…hope that’s okay with people if they’re signed on the back only). I’m letting the glue dry now and will then stretch some unprimed cotton canvas I found in the closet over the panel. I’m using 1/4″ plywood for the face, and something called aspen wood( not real hard though) on the back for the braces. Seems like I delved deep in my memory and decided I thought butted corners are stronger than mitered and that helped me just plod along since I’m not that great with a saw that you have to put muscle power behind anyway. I placed, glued and clamped two edges that were parallel first (hope that’s a good idea) and measured to cut off the other pieces to fit between on the other sides. I did as little measuring and sawing as possible by buying this stuff pre-cut at Lowe’s. I haven’t read anything about having to put a coat of anything on the back for warpage so on I go. 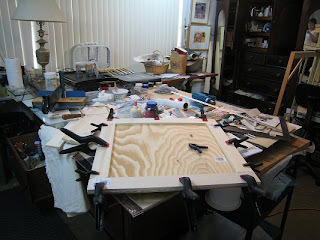 I won’t need anything on the front of the panel since encaustic wax doesn’t react with wood like oil does. …and this will have canvas next to the wood. Will I glue this canvas down or not?….I’m not sure but I don’t think it’s supposed to be necessary. When all is ready, I will layer, brush on a couple of coats of encaustic medium, burn in and be set to go….I hope, crossing fingers. he he he…just noticed that I can see myself taking the picture in the mirror of the old wardrobe holding painting supplies. Curry took a couple of pictures of me working on the next two panels. On these pieces, I’ve already got a couple of layers of medium, lightly fused and cut up some collage pieces to lay on top. I put a larger piece on one panel and a smaller one on the other. Now I’m adding a lot more medium to get it all “glued” down. Who knows what will happen but I’m gonna try laying in some oil paint and layering wax medium over it, fusing, and see what happens. I, also, think I’ll get out the graphite and see what happens. I noticed it’s kinda hard to “draw” anything on wax so I’ll just keep experimenting around and see what happens.